Vacation. Alex is on vacation for two weeks. We like to say that he won't have to return to work until next year. It's one of my favorite Yuletide traditions; his taking time off so that he too, can do the baking and making he so enjoys, as well as making time to savor the joys of home and family. We started our first day of his vacation by staying up far, far too late to watch a movie together. Alex and I laughed until we were hoarse. Being together, sharing little things like a blanket in front of the fire and a goofy movie, is important to us and it's easier to make this happen during vacations when he doesn't have to be out the door so early the next morning. So what if we saw 3am come and go? So when I found him downstairs this morning, looking all spiffy and bright-eyed, making truffles (and ganache to dip his coconut pyramids into, of course), I should have been surprised. But I wasn't. Alex takes tremendous pleasure in making home and keeping traditions, much like I do (as do all of us, really). Somehow yesterday, even the kids missed all of his other cookie-making, probably when they were both still negotiating the finer points of gingerbread house building, so when he was pulling tub after tub out of the fridge, each full of bon-bons, truffles or pyramids, they wondered when did he do all of that? And if anyone should sneak a precious truffle and leave behind evidence in cocoa dusted fingerprints in the kitchen? Or when he comes over while I write this post, to pop a truffle into my mouth? He just shrugs. 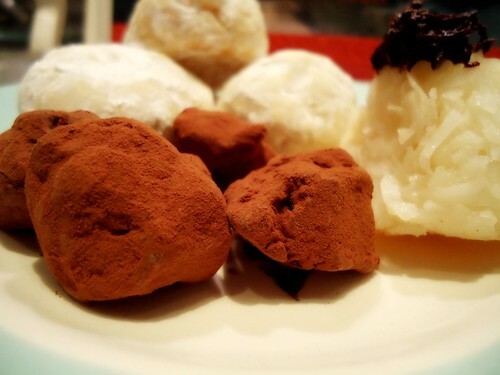 Truffles are easy, and he can make more, he says. He's on vacation and he's the Cookie Man. sweet. you are lucky you share these ideas and values. 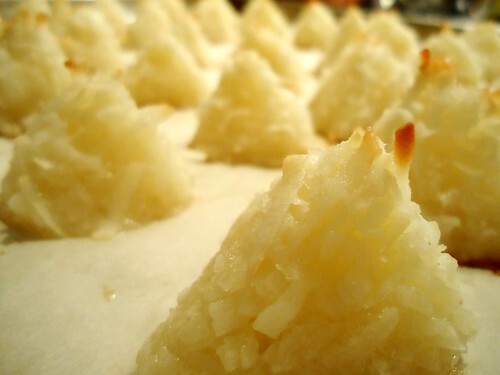 and pass me one of those coconut treats! What a lucky woman to have a man that bakes! My husband's specialty is breakfasts (I haven't made pancakes since I've been married), and BBQ. We're looking to have my husband with us every day, too, starting from this Friday until the 2nd of January. We never feel completely whole when he's away. Liane, you are most welcome, anytime. Chris, same here. Alex cranks out a really incredible breakfast as well. And I know just what you mean, about having him *home*.